Company representatives from FHCA member nursing center sand ALFs traveled to Tallahassee recently for meetings with legislators, regulators and other long term care stakeholders. 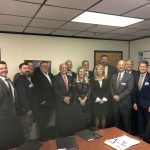 FHCA also had the opportunity to showcase our Education and Training Center to members of House and Senate leadership, who took time to visit with our company representatives while they were in town. 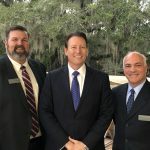 FHCA advocacy partner Our Florida Promise President Andrew Weisman brought the group together to meet with Senate President Bill Galvano (center; R-Bradenton) and other members of Senate and House leadership, along with Chief Financial Officer Jimmy Patronis and Attorney General Ashley Moody. Several members met with the new AHCA Secretary Mary Mayhew (right center), providing an opportunity to share more about the quality initiatives members are focusing on to improve residents’ health outcomes. Discussions also surrounded how FHCA and providers collaborate with AHCA to keep residents and staff safe during disasters. Other members attended the Senate Appropriations Subcommittee on Health and Human Services meeting, during which Tom Parker of our staff delivered a presentation about the Prospective Payment System. 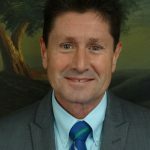 Tom specifically highlighted how the $138 million funding increase passed during the 2018 session has positively impacted nursing centers’ quality improvements. Those measurable increases will help lay a foundation this session as we advocate for the Legislature to renew the Medicaid funding increase in the 2019-2020 state budget. Click here to watch video of Tom’s committee presentation. These visits to Tallahassee are an important part of our legislative strategy, and we look forward to seeing more members join us for our weekly Lobby Wednesdays when the session begins in March. 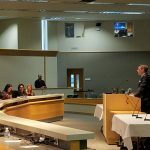 Connecting face-to-face with legislators and regulators provides an excellent opportunity for members to highlight their quality care, discuss the challenges providers are facing and discuss the importance of long term care in Florida’s health care delivery system. To see more photos from the Our Florida Promise advocacy meeting, click here.